Shut the hell up, I explain. Do you know how many horror movies start with the letter Y? How many movies, period? Not a whole hell of a lot, that’s how many. 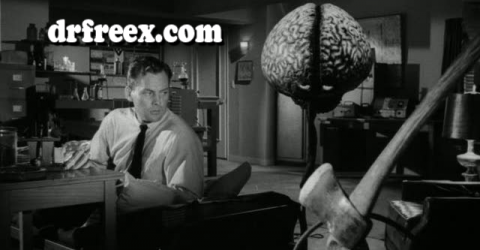 I just watched Xtro 3 because the letter X has the same damned problem and I am out for blood. Do not cross me. The subject was brought up as we were planning this expanded Hubrisween, and the guru Tim Lehnerer came up with the Blank Scrabble Tile rule. There are two possibilities, currently: If you cannot find a movie with a troublesome initial, you can use the letter to either side of it (X and Z, riiiiight); or: you can substitute a title that begins with an actual number. So here we are in the tiny city of Barrow, Alaska, the northernmost settlement in America. So northern they go through a night thirty days long, just like in the title. Its population dwindles by two-thirds during that month; not everybody can take that much dark. This time around, there’s a few problems. Sheriff Eben Oleson’s (Josh Hartnett) estranged wife Stella (Melissa George) misses her plane and is stuck there, for instance. There’s trouble with the phones. There’s also a stranger in town, and it turns out he ‘s trashed the local helicopter. And killed all the sled dogs. Oh, and there’s a pack of vampires following him. So what we have here, in a way, is yet another zombie siege film, with the added complication that the undead are intelligent, smart and vicious. 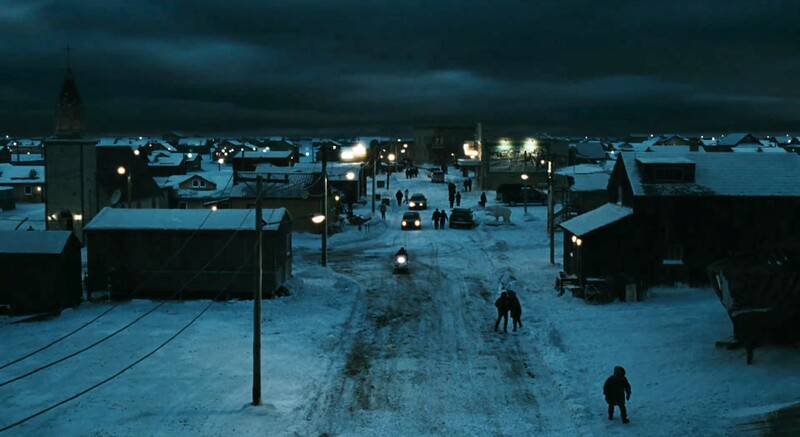 Not having to worry about sleeping during daylight hours, the vampires massacre most of the remaining town openly, until we are down to a small band of survivors who keep moving from location to location as their numbers dwindle due to one misadventure or another. So right there we have one of the major reasons I put off seeing this; if you’ve been here any length of time you know about my ten-year moratorium on zombie movies. What is not as common knowledge is there was a similar moratorium earlier, on vampire movies. Not all of you may be old enough to remember the glut of bloodsucker flicks in the 90s, but it takes quite a few of any sort of movie for me to say “Alright, jeez, enough” and there were quite. A. Few. 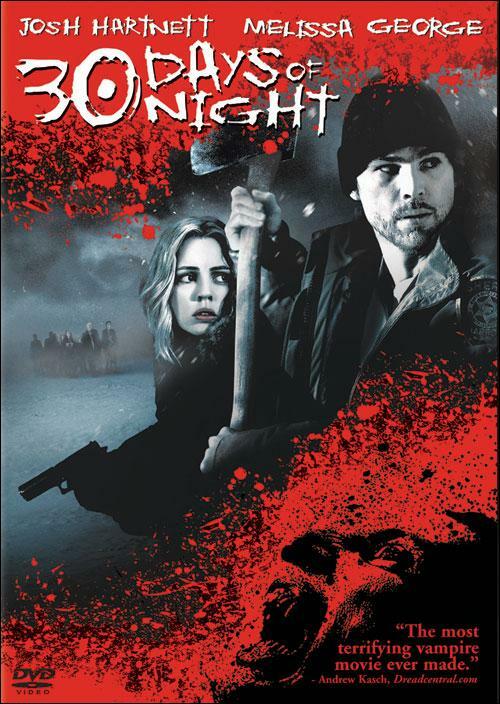 That being said: 30 Days of Night has a good concept, and is well-made. The vampires are cool, animalistic yet speaking their own language. There is a third act twist which is unexpected and welcome. The aforementioned mixture of zombie and vampire movies, I suspect. The lapses in logic that seem almost inevitable in a horror movie, but are they? Really? (These are some pretty wasteful vampires. Horrific as the slaughter is, why so many at one time, when you have a month ahead of you? Then other survivors keep cropping up as the 30 days wear on, just because we need a complication or a reason for our protagonists to endanger themselves) I wasn’t in the mood for a vampire Diary of Anne Frank (the survivors leave that attic hideout before too long, anyway). I kind of like my horror movies to cash in at the hour and a half mark. This one is close to two hours. None of these are, in and of themselves, enough to kill a movie for me, and I suspect that had I not seen 30 Days of Night at the very end of a month of watching horror movies, I might have been a little more kindly disposed toward it – but only a little. As it is, I don’t find it terrible, I just don’t find it exceptional enough to excite me in any way. It did all right without my support, though, spawning at least one sequel, so I’ll leave it here with a sort of a shrug. This situation reminds me of Stakeland, which is another movie that should be completely in my wheelhouse, and yet I just don’t care for it. Your mileage may vary, this movie may press all the necessary buttons for you, and that’s cool. But oh my God am I ready to watch something non-horror related.